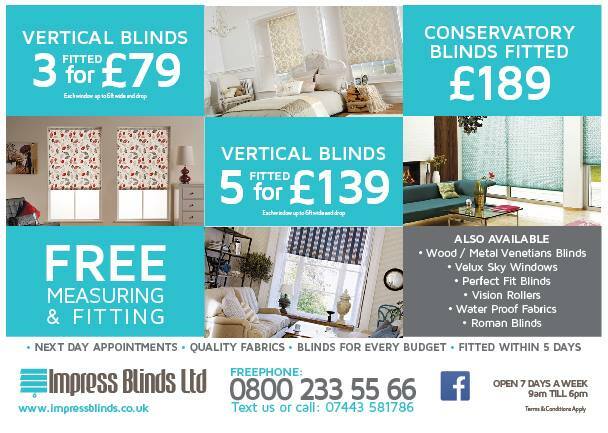 Having qualitative years of experience and efficient Staff, impress Blinds offers best window treatments and cheap window blinds in Leigh, the greater Manchester and all over UK. With a huge variety of vertical blinds, Velux blinds, conservatory blinds, roller blinds, wood blinds, vision and Venetian blinds, we invite you to explore our latest designs and styles. Made up of fine quality fabric, all our blinds are designed to blend into your home decor, creating the ambiance you want. All our blinds are energy efficient; meaning that they reduce the heat in the summers and heat loss in winters and make your living space more comfortable. Whether you want a traditional touch or a contemporary look, we provide you the best window covering solution suit your home style and budget. Our elegant and easy to clean window blinds work well in both homes and commercial premises. This is the reason we’ve hundreds of thousands of domestic and commercial customers in Leigh, Lancashire and throughout UK. Our exceptional quality material, quality services and cheap rates are second to none. Our made to measure blinds are made to the highest standards, complying all the new and safety regulations. Ranging from soft to bold colours, formal to casual patterns and textures, our beautiful blinds enhance the décor of your space including kitchen and conservatories. We, Impress Blinds know how to make our customers happy and fully satisfied. So, we offer complete and free of cost measuring and fitting services to all our clients in Leigh and all over UK.